The weather is colder and while that is great for EVP (because there is no more bugs chirping away), it can cause other problems. The pic to the left is one I just took a few minutes ago. 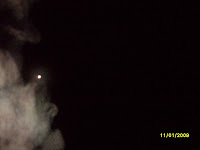 Looks like maybe a ghost and a mist beneath it. Cool pic. Unfortunately, it is just my breath as I exhaled, on purpose. It can look like a whole host of things when you do this. There is an experiment you can do in the winter where you purposefully take a picture like this and see if any ghosts use it somehow. Try it in a known haunted area like Gretchen's Lock for example and look for images or written words maybe to appear in the mist. I was not doing that for this picture. It still turned out cool and I will keep it, but to use to help you debunk your pics and video images. That makes a thermometer that much more important to use, by the way. Most images I see where it is claimed to be paranormal, the first thing I look for is if any one in the pic has a coat on. That is your first indication that you could possibly debunk it. Or, I ask when the pic was taken. If they say in the winter or early spring for example, it most likely isn't paranormal at all. Please just keep it in mind as you travel out into the night looking for ghosts. You want it to be real, not a logical explanation. But do keep the pic if looks way cool.